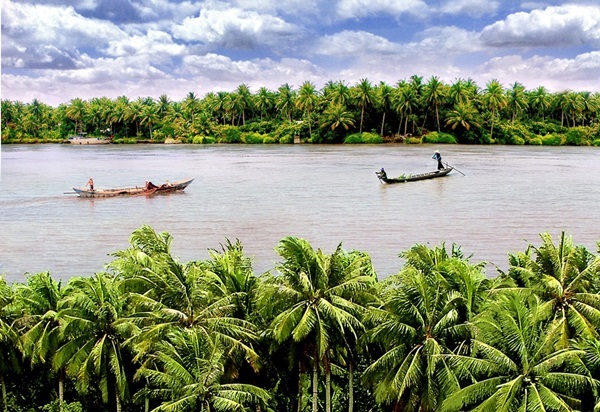 In the Southwest area, Ben Tre is well known as kingdom of coconut with a sunny climate all year round. However, it is better for you to visit Ben Tre in summer when you not only enjoy colorful natural paintings but also try many fresh fruits on the trees such as mangosteen, durian, rambutan, etc. Travel to Ben Tre, you will be welcomed by friendly local people. Friendliness is the outstanding characteristic of the south man in general and Ben Tre people in particular. Images of sweet country girl in Ba Ba – their traditional clothes, honest farmers with smiles will surely leave you with the unforgotten impression. For example, if you lost the way, ask the people here, anyone is willing to help you carefully. 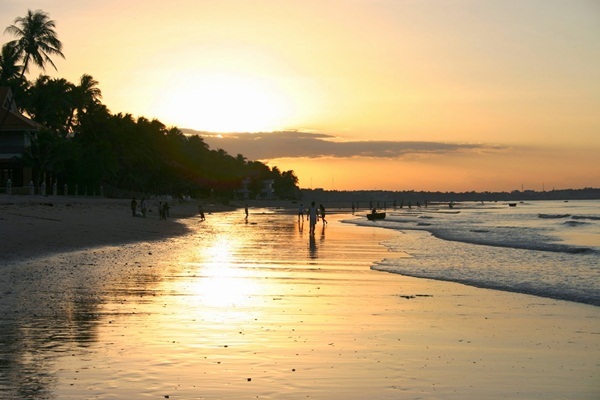 Moving to Ba Tri, Thach Phu, you will come to the beautiful beaches such as Con Nhan, Con Ho (Ba Tri); Con Bung, Con Loi (Thanh Phu) to swimming, visiting the mangroves and enjoy the fresh sea specialties such as clams, oysters, snails, crabs, shrimps, etc. with an affordable price. You can also organize a picnic, camping in the weekends here. In the morning, drink tea scented honey, go study the honeybee breeding process, enjoy traditional southern music in a peaceful space. Then, sit on the carriage running on rural country roads to watch the daily activities of the Ben Tre people. In the afternoon, visitors will have the opportunity to watch the sunset on the river, the sun drops below the horizon gradually, yellow lights shines on the river in three -dimensional space with sky, vast rivers and green coconut trees, which is considered as painting. In the evening, tourists can go canoeing on the river watching firefly, feel the beauty of the West River, then gather around Ben Tre warm families to tell each other stories about everyday life. This is a new type of tourism, which gives you the interesting experiences. Visitors can stay with local people, garden with them and join in cooking the family meal, enjoying the typical dishes of Ben Tre. 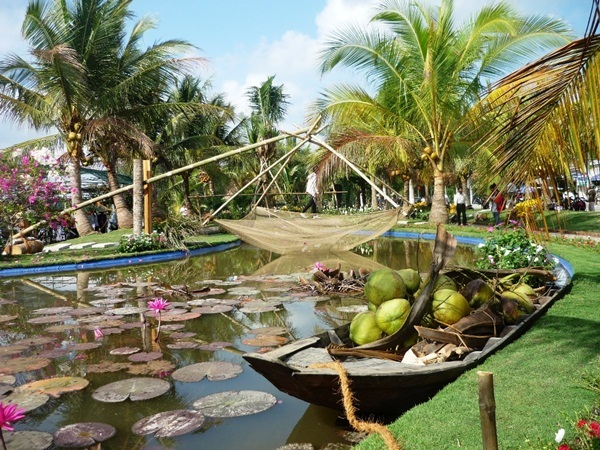 Besides, one of the locations attract you in your Ben Tre Travel is handicraft villages. It is very meaningful for you to learn how every bricks are produced as well as understand the difficulties and hardship of farmers to get the perfect bricks. Ben Tre is homeland of coconut, so Ben Tre cuisine has many delicious dishes relating to many parts of coconut. Ben Tre coconut candy is the most delicious in the country. Ben Tre coconut candies combining with states of durian, peanut, etc. provide diverse flavors and express the creativity of Ben Tre people. Other parts of coconuts are made use of to process many delicious cuisines. One of them is coconut pancakes. This is delicious rustic cuisine of southern people. Travel from Saigon to Ben Tre, you can see every places has their way to get own delicious dish. In Ben Tre, beside shrimp, meat, prices, mussels, mushrooms, eggs, the old coconut is the main materials to make pancakes. When trying Ben Tre pancakes, you can savor the flavor of natural sweet of coconuts mixed with other materials which make the characteristics of Ben Tre pancakes. In conclusion, all of the above brief information can help you for a nice Ben Tre travel. 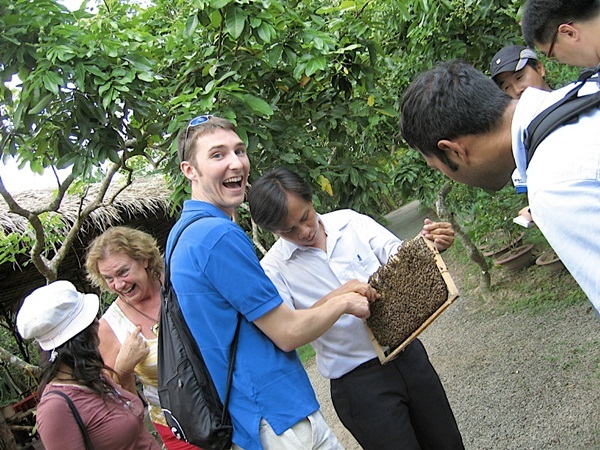 All you need to prepare is a free spirit and a willing to enjoy Ben Tre with the unique culture of the West River area.